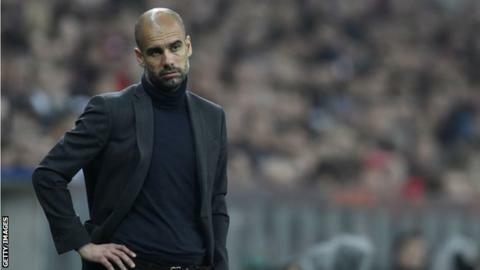 Bayern Munich boss Pep Guardiola says he will not change his tactical approach, despite criticism after the Champions League defeat by Real Madrid. The Bundesliga champions were thrashed 4-0 at the Allianz Arena, losing 5-0 on aggregate in the semi-final tie. "I have my ideas and I have to convince my players," said Guardiola, whose team dominated possession in both games against Madrid without scoring. "Following this defeat I am even more convinced of my philosophy." Former Barcelona boss Guardiola led the Catalan club to 14 trophies in four seasons between 2008 and 2012, with the success built on his short passing and possession-based 'tiki-tika' philosophy. He has instilled a similar approach at Bayern since replacing Champions League-winning coach Jupp Heynckes last summer, leading the Bavarian club to the Bundesliga title in March with a record seven games to spare. Bayern could also win the German Cup if they beat Borussia Dortmund in the final on 17 May. But the manner of Tuesday's Champions League exit drew criticism from Bayern chairman Karl-Heinz Rummenigge and honorary president Franz Beckenbauer. Rummenigge called it a "debacle", but added the club must stay "rational", while club legend Beckenbauer added "something is not right". However, 43-year-old Guardiola insists he remains happy with the team's progress in his debut season in Germany. "I am surprised that we won the Bundesliga so well in this season," said the former Spain midfielder. "We showed a lot of good things. I am satisfied with this squad. We were outstanding with this system and these players." A new twist in Man Utd's manager hunt?